» List of Jumeirah Dubai Resort, Luxury Beach Resorts in Dubai, Best Priced Jumeirah Resort in Dubai, United Arab Emirates. Online reservation and booking system will give you the best choice of luxury Jumeirah Dubai resort, Dubai luxury hotels and Dubai family hotel rooms all at best prices. » We assist visa to Singapore, Malaysia, Thailand, Schengen, South Africa, China & more.. 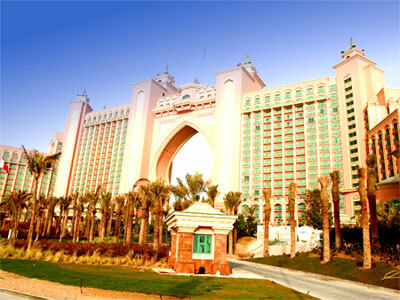 Situated on Dubai’s famous Palm Jumeirah Island, the 5-star Atlantis offers clear views of the Persian Gulf. It provides an underwater aquarium, dolphin-swimming opportunities and an extensive water park. Spacious guest rooms at the Atlantis Dubai feature Arabian décor and large beds. They all have balconies with panoramic views and are equipped with flat-screen satellite TVs. Fine dining restaurants include Catalan, Italian and French. The award-winning Nobu restaurant serves contemporary Japanese food. Atlantis The Palm Dubai include an underwater labyrinth and the largest water park in the Middle East with near-vertical slides and torrent rivers. A comprehensive spa provides facial and body treatments and the gym provides personal fitness coaches. The Emirates Golf Club is 3 km away and The Dubai Mall is a 20-minute drive away from the Atlantis. Atlantis, The Palm the flagship resort on The Palm Jumeirah. Created by Kerzner International Holdings Limited, a leading international developer and operator of destination resorts.